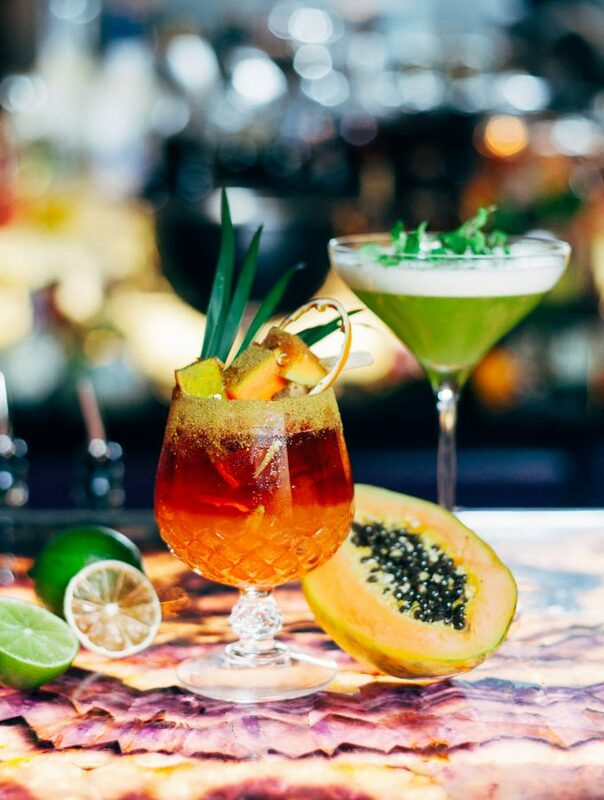 The vibrant atmosphere of GRACE Bar successfully revives the roaring 20ies, where today’s Gatsbys mingle and celebrate, sipping on signature cocktails or champagne. GRACE Bar is operated externally Tuesday through Saturday from 7:00 pm and can be booked for exclusive events. Kaffir & Red Dates infused Rumaretto. Ambrato Vermouth & Pink Grapefruit. Apostoles Mate Gin, Pandan Syrup. Oysterleaf. Matcha Powder. Mosto Verde Italia Pisco. Fruity Aji Panca Bell Pepper. Soda. Pyrat XO & Navy Rum. Papaya à Ras El-Hanout. Lemon. Cinnamon & Vanilla. Nikka Pure Malt Black. Galangal Honey. Bergamotte & Fresh Mint. Grey Goose Vodka. Lychee & Mango Chili Salt Espuma. Sparkling Sake.